As it is with any procedure or specialized treatment, you will be expected to maintain the results achieved from your braces in Daytona Beach. Although you’ll be visiting your dentist for your regularly scheduled six-month checkups, most of the maintenance will be at home, which means you’ll be strongly encouraged to wear retainers to prevent your teeth from shifting back to their original position. Since there are so many different types of retainers available, your dentist may suggest Vivera® retainers. Just like Invisalign braces are clear, so is this retainer, and it’s made from an impression of scan of your teeth. You may hear horror stories of people having to replace their retainers because of breaking or damage, but these are made from a proprietary material that is 30% stronger than other clear retainer materials. With stronger materials comes cost; however, because of individual dental needs, you’ll have to contact your dentist to determine the price of your retainers. As an added benefit, in case you lose one, each order includes an extra set. How Long Will I Have to Wear My Retainers? It will be a gradual process, so don’t expect to only wear it every now and then for a few months. Your dentist will determine a proper timeline, much like your Invisalign aligners. In the beginning, you can expect to wear your retainers all the time; however, based on the recommendations of your dentist, you will gradually lessen how often you wear them until you’re only wearing them at night. 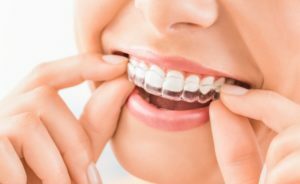 How Should I Clean My Retainers? You can either opt to buy special products sold by Invisalign to clean your retainer, or you can use at-home remedies such as soaking your retainers in lukewarm water mixed with soap. You’ll need to gently use your fingers to scrub any saliva and bacteria out of the retainers. Don’t use a toothbrush or toothpaste as they are hard on clear retainers. The aftercare of Invisalign treatment isn’t so bad. Wearing a retainer is a simple step to ensuring your smile stays straight for a long time. If you’re concerned or have questions about your post-treatment care, make sure to talk to your dentist. At Lakeside Daytona Dentist, we provide our patients with state-of-the-art dental services. If you’re looking to straighten your smile, we offer the appropriate treatment for your dental needs. Our expert team can walk you through proper care and maintenance so you will keep your beautiful new smile for years to come. Contact us via our website or by calling (386) 274-2021 to learn more about how we can help you.